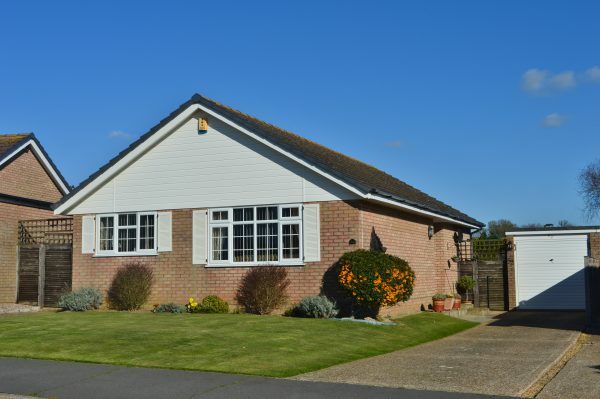 An attractive detached bungalow situated in the favoured East Blatchington area of Seaford, approximately a mile and a quarter from the town centre and mainline railway station. Chalvington Fields and Blatchington Golf Course are within easy reach, with local bus route nearby. The well presented accommodation comprises L-shaped entrance hall, sitting room with dining area, kitchen, two double bedrooms, shower room and cloakroom. The long drive-way in front of the garage offers ample off road parking, whilst to the rear are the superbly arranged and maintained gardens with lawn, pond feature and well stocked beds and borders. The property has the benefit of gas central heating and uPVC double glazed windows and external doors. Viewing is highly recommended to fully appreciate this delightful bungalow.